Welcome to my first ever OWLS Bloggers‘ Blog Tour post. This January’s topic is “Disruptors.” Arria from Fujinsei did an excellent job with her post about “Disruptors” in Mobile Suit Gundam 00 which can be read here. “To disrupt” has a negative denotation, but rather than looking at the verb in a negative light, we are going to use the verb in a positive way. It’s like the word, “protest” which has positive and negative connotations depending on the perspective of the person. While I was creating this topic, I wasn’t sure what anime I would take on since I mostly focus on shoujo anime. So rather than watching a completely new anime or recalling some of the more longer and popular animes like Fullmetal Alchemist or Naruto, I decided to stick to my roots and pick a shoujo anime that applies this act of disruption, and the anime I picked is Ouran High School Host Club. The character I’m going to talk about is “Ranka” Fujioka, Haruhi’s father. After Haruhi’s mother passed away, “Ranka” Fujioka took on the role of mother and father. Despite being a crossdresser for work, “Ranka” continues to roleplay at home in order to be the father and mother figure that Haruhi needs in her life. However, Haruhi seems to be mature and independent enough that she doesn’t need childish treatment. Yet even though she gives an independent persona, Ranka can’t help but follow her around at the supermarket to make sure she’s safe which shows his caring and nurturing side of a mother and his overprotective fatherly side when he mistakenly sees that Tamaki is putting the moves on Haruhi. How is he a Disruptor? His disruption is shown by reevaluating the viewers’ perspective of family dynamics and gender standards. It’s natural for children to be raised in broken households where one parent is the mother and father figure. Haruhi comes from a single parent home. Her father acts as both parental figures in the most literal fashion and raises Haruhi in a loving home by himself. In addition, Japan is a society embedded in patriarchy values and system. However, Ranka is a character that disrupts this way of thinking and proposes the normalization of nongendered identities. In fact, his daughter, Haruhi adopts a non-gender persona. She dresses a little tomboyish and joins the male host club, but outside of her school, she dresses a bit more feminine and does domestic work at home, the typical social standard for women. By having a character like Ranka, he inputs a different “nongender” philosophy within Haruhi and as viewers, we are able to put into question and reevaluate gender for characters and real life people. Ranka allows viewers to be aware of gender classification and it disrupts the standard of how we see gender through traits and actions. Rather than placing individuals into gender, a person should be able to freely choose his or her identity or even, ignore gender altogether. As a result, individuals are able to be themselves without agreeing to gender standards. On a side note, I realized that my post is published on Martin Luther King’s Day. I want to say to you all, Happy MLK Day! I know that Dr. King fought for civil rights, particularly in the black/African communities, but his efforts help other minority groups and immigrants as well. Although my post isn’t focused on racial issues, it does relate to the cause since I’m proposing that individuals see others beyond skin color or gender. 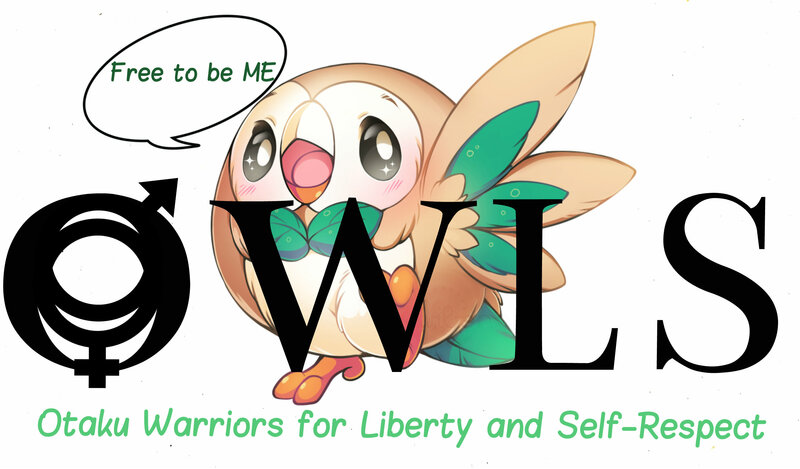 OWLS’ motto, “Free to be me,” should be seen as a “civil right” in today’s society. Our next “Disruptors” post is by Crimson which you can check out January 20th! Also if you are interested in learning more about OWLS or are interested in becoming an active member, click here. Butler, Judith. “Performative Acts and Gender Constitution.” Edited by Julie Rivkin and Michael Ryan. Literary Theory: An Anthology. Blackwell Publishing, 2004, pp. 900-911. The idea of gender and gender norms (and disrupting them) came up with a few of the characters throughout Haruhi. While on the surface this anime seems very light it touches on a number of real issues. Thanks for sharing this post. This is a really interesting post Lyn! I haven’t seen this anime but the way you described the characters, it looks so amazing. Ouran is one of my favorite shoujo anime/manga. It’s a must-watch. I hear it is pretty funny and good. It’s one of those shows I need to watch lol. I know I already said this on Twitter but it bares repeating, AWESOME POST! I love how you brought gender fluidity and equality into the blog tour. Ouran is one of the anime I’ll never get tired of watching over and over again! I haven’t really given much thought on Haruhi’s father so it’s a nice thing that you’ve focused him as the disruptor in this series. Nice post Lyn! This is my absolute favorite anime for the exact reason of basically ignoring gender roles. I love the points you made about Ranka, he’s probably one of the best parental roles in anime. Loved reading this. The show balances being entertaining yet unafraid to tackle serious issues. Ranka is a great parental figure! Lyn talks about the single parent who disrupts gender norms by being awesome. Ooh, Ouran, an unlikely favorite of mine! It’s funny that you showcased this topic on Ranka, since anyone else writing over this show would likely pick one of the guys or Haruhi herself. I like Ranka. I like what Ranka stand for. And I really like the fact that Ouran demonstrates that a family needs parents of both genders (or traits of both) in order to function. BUT it is possible for one individual to embody both auras. Now that–that’s something! Way to out of the way to enlighten us on the wonderfully unusual, Lyn, and nice contribution to the Disruptors cause! Thanks! :3 When I first thought of the OWLs topic, I thought about what I wanted to write about and it’s tough because I usually stick with shoujo, and “disruptors” seems more of a major topic in action/sci-fi anime as oppose to shoujo, but luckily I was able to take a spin on the topic to my advantage. Thanks again! Oh wow, Lyn-sama. What an original take on disruptors. /applause/ And using the shoujo genre, too! Excellent interpretation. I love the character of Ranka in Ouran! He rocks! A single parent who is also a crossdresser. Many mistakenly believes that all crossdressers are gay, but this is not the case. Also you touched upon a good point about gender expectations os society where a girl has to act feminine and a guy has to act masculine. Today especially in developed and progressive countries, there are many stay-at-home dads while the moms are at work. Does this make the dad feminine? I don’t think so. It just makes him a more “family man” who can prove that dads can also take care of their babies. Once again, great tour post. Thanks for writing this, Lyn-sama. Cheers! First off thank you so much for your patience! I know I haven't been my usual posting self as of late. Unfortunately that trend is going to continue for a bit. You can basically consider me on vacation until about April. Waaaaaahhhh! I'm sorry everyone but currently my life is very hectic. I swear I shall tell you all about it in good time. In the meantime please bare with me as best you can. During my little hiatus I will still be posting for OWLS! You can expect my next OWLS post on February 15th discussing Yuri On Ice and normalizing the LGBTQ Community. You can expect another OWLS post from me in March (date TBA) on Sanctuaries. I will also try my best to keep up with my Flashback Fridays. They will be hit and miss though depending on my crazy life. Speaking of Flashback Friday today's flashback is brought to you by Lyn Lyn from LynLynSays! She posted this beauty of a post on January 16, 2017 for our very first OWLS Blog Tour. What I love about this post is how Lyn used Ranka from Ouran High School Host Club to discuss how disruptors often force others to review their own perspectives while relating to another's. On top of that she is also able to link it to the late great Martin Luther King Jr. ❤ He is one of my heroes and I love how Coretta Scott (his wife) has spoken out in the past discussion how she feel MLK would have used his position to speak up for the LGBTQ community if he were still alive. She herself used her position to raise awareness for LGBTQ Rights. Talk about to great disruptors! Once again great work Lyn Lyn! If you all have a chance you should visit LynLynSays for even more top notch articles. Well deserved! Great work on the post once again Lyn! This was a fun post! I was excited to find your first OWLS post after reading so many of your later ones. Host Club was a great choice for this topic. I enjoyed finding this anime when I first gave it a watch. I hadn’t watched many other series with a character who didn’t have a gendered identity. Throughout the show, then, it really stood out to me whenever the host club boys would push gender expectations on Haruhi, much to her bafflement or annoyance. When her father was introduced, these expected norms were even more emphasized, as the boys weren’t sure what to think. I was too distracted by the clownish presentation of this character that is often found in anime to fully appreciate Ranka. Thanks for the post. Thanks for the comment and I’m glad you enjoyed my post. When coming up with this topic, I thought of Ouran as the perfect choice for it. That makes sense. My understanding of denotation is as fact without opinion or emotion attached. The connotation is the emotion and opinion part. Given that, I am not sure that a denotation can be negative, but might need to investigate!